Pour one out for the sea creatures along the English coast. First, cold waters ushered in by the “Beast from the East” storm last week weakened aquatic life. Then stormy weather finished them off, turning North Sea beaches into a scene out of an aquatic Dunkirk. 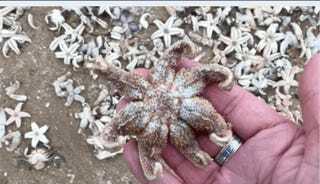 Beachgoers reported ankle-deep pileups of dead starfish, crabs, and mussels on England’s east coast over the weekend. It appears some lobsters were able to survive the turbulent tides that brought them ashore, but most crustaceans and echinoderms perished. There was a three degree drop in sea temperature last week which will have caused animals to hunker down and reduce their activity levels. This makes them vulnerable to rough seas – they became dislodged by large waves and washed ashore when the rough weather kicked in. Larger animals such as dolphins are more mobile and can save themselves by swimming away when this sort of thing happens. The Norfolk Wildlife Trust, which manages land to the south of the Yorkshire group, reported a similar mass die-off along the coast there. This isn’t the first chilly ocean die-off this winter. During January’s cold snap in the U.S., frozen sharks were found off Cape Cod (though they may have died from being caught in shallow water) and sea turtles were found stunned in the Gulf of Mexico off of Florida. Land animals also suffered, including iguanas that were turned into popsicles. The turtles and iguanas, however, by and large survived their freeze. The same cannot be said for their transatlantic counterparts. Lara Maiklem, a local who works in publishing, described the scene at Ramsgate beach—on the southern end of England’s coast and located about 80 miles east of London—as “like the armageddon” to The Independent.